Every couple of years the Wu reunites in an attempt to save hip-hop and revive the most diverse, and odd collective of emcees the hip-hop nation has ever known. The sad part is that inevitably it never works out and the clan ends up being bickering brothers afterwards and they swear off working together only to reluctantly reconvene. This might be the problem that has plagued every release since Wu-tang forever the feelings that these albums are more pain than pleasure. 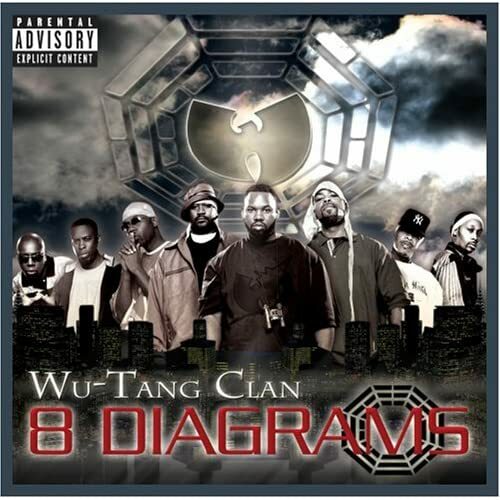 8 diagrams sticks to the same Wu-tang themes of obscure kung-fu samples and song titles that rarely if ever have anything to do with the actual lyrics. This is a problem in this day and age where thought and creativity are all but nonexistent. Lyrically the album is incredibly solid with even the RZA able to hold to topic and a static flow, just check "sunlight" whose slow brooding beat allows you to pay attention to the voice on the track and not an excess of noises. "Gun Will Go" which stars Raekwon, Method Man, and Inspektah Deck is one of the better songs on the cd. The biggest issue with the Wu is that the less charismatic members such as U-God, Rza, and the lyrically proficient but socially and delivery challenged Gza hold the LP back. While they are still able to spit darts they are to incoherent and fly in too many different directions at time to form a cohesive bond. Any track without Meth or Ghost (and to a lesser extent Raekwon) feels empty by comparison. Production wise, Rza drops some decent tracks on the album, but the sound is too consistent with early 90's. The group would have done better to look outside of the circle and try something different to bring out something new. There is nothing wrong with basement hip-hop but these guys have the pedigree and ability to be able to branch out and hit many different sounds instead of the same one again and again. Quotables and hot bars abound every clan group recording but learning to have different deliveries and add something to their voices could help the lesser known members (in the public circle i know all true hip-hop heads know the Wu) gain their own identities and not be forced to ride Meth and Ghosts back. The production's slowness becomes stale by the end of the album as the one single sound begins to wear on the listener. It's too bad because this is better than the iron flag and has some gems hidden within that may never be unearthed due to the climate of today. The Wu deserves better.